Pro:Idiom™ is an encryption technology developed by LG for use in the hospitality industry for the secure delivery of high definition digital television & video on demand (VOD) signals. HBO, Showtime, ESPN and other digital television content providers require encryption of the HD signal in FTG Hospitality environments where a set top box is not present in each room in order to protect their content from piracy. In a phrase, Digital Rights Management. 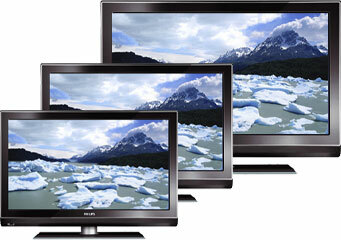 Content protection was not an issue for standard definition hotel television systems during the analog era, but as hotels have moved towards high definition (HD) all-digital programming on their TV systems, content providers have required digital rights management to protect their signal. Today the high definition television signal you receive on your Hotel TV System from the satellite or cable TV provider is 100% digital. That digital television content is easily pirated if the signal is not encrypted. Content providers like HBO, SHOWTIME, ABC and other TV and movie channels are requiring hotels to have an encrypted signal going to the television in their rooms to prevent piracy of the content they produce. What Does All That Mean for Your Hotel? The delivery of a Pro:Idiom encrypted HDTV signal to your guest room TVs requires a hotel television distribution system that allows a central decoder to decrypt video from a high definition headend or satellite feed and re-encode it for secure delivery to the TV sets in each room. We have Cable. Does that Mean We Need a NEW Television System? If you have a Cable TV provider, it will mean one of two things. In the end it means possibly tens of thousands in costs for new fiber to be installed and for new equipment. 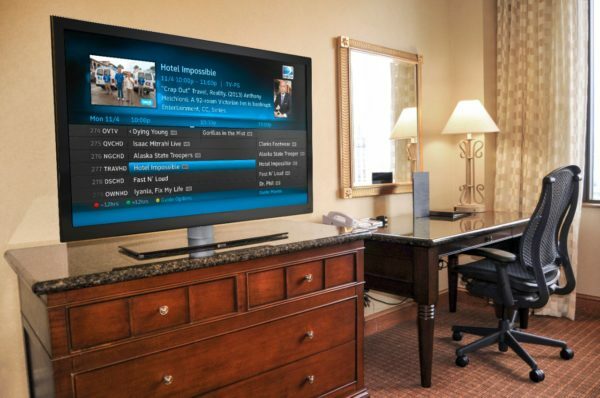 What are our Hotel Television System Options? Your options are TV for Hotel systems with Set Top Converter Boxes at each TV to decrypt the HD signal and Headend type systems. High definition headend systems utilizing Pro:Idiom eliminate the need to use set-top boxes in-room. With legacy systems, set top boxes are a possible signal security fail point in your Hotel TV system and a COM2000 Pro:Idiom HD headend system eliminates that signal security fail point. When it was introduced in 2009 the 1st Pro:idiom headend, the COM1000 HD headend system, was a revolution in Hotel TV Systems. The new COM2000 Pro:Idiom HD headend TV system brings the technological advances, convenience and the features that quickly made the COM1000 the industry standard for hotel television systems. Since its release in 2015, the COM2000 HD Headend System from Technicolor (formerly Thomson) has continued to be the industry standard for hotels with more than 100 rooms and smaller hotels that do not have home run wiring. The COM2000 is a virtually plug and play hotel television system that draws just 225 watts of power and takes up just 3U of rack space. On the right that is a complete 48 channel COM2000 Pro:Idiom HD Headend. One of the biggest benefits is the nearly plug and play compatibility of the COM2000 HD Headend. In a 24/7/365 industry, the ability to simply cut over to a new system with little or no downtime is a critical difference. The COM2000 brings many of the best features of the COM1000 into a new smaller and more energy efficient HD headend system while maintaining the nearly plug and play platform. This new system is super-stable and full-featured right out of the box. 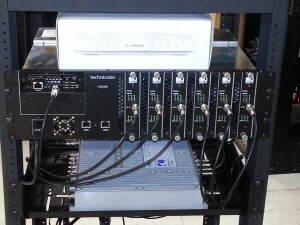 Built-in Gigabit Ethernet allows for easy monitoring by laptop plugged into the front panel ports. With the NEW COM2000 you can increase channels easily by adding receiver blades, the system includes redundancy of key components to give you peace of mind that you system will maintain uptime, it supports both RF and IP based networks, the system automatically tracks DIRECTV programming changes, and can be monitored both on your local LAN and remotely via a built in web interface. The COM2000 is also backwards compatible with the COM1000 HD Headend System so you can expand on an existing system or upgrade. What Type of TVs Do I Need for Pro:Idiom? A hotel television signal encrypted with Pro:Idiom requires a HD TV that can decrypt that signal. LG, Samsung, Panasonic, Sharp, and Philips manufacture hospitality televisions that have an integrated Pro:Idiom chip to make that encrypted signal visible on the TV. Pro:Idiom is widely used in hospitality environments and has become a standard feature for hospitality televisions. Some of the largest Hotel brands from Choice to Hilton are specifying Pro:Idiom as their approved TV type. According to the SBCA, COM1000 and COM2000 High Definition Headend Systems using Pro:Idiom Digital Rights Management are installed on more than 2.0 million out of the 5.5 million total screens in the U.S. hospitality industry.